The Gears of War series is about to make its debut on Xbox One. A remake of the first Gears game will be released for the new-gen console soon. Gears of War's Xbox One remake will have updated graphics, according to Polygon's report. The game will have upgraded lighting and textures and run at 60 frames per second. The cinematics are also being remade by animation studio Plastic Wax. Soon after Polygon's report was released, several gamers in the United States were invited to a test of the Xbox One remake. Kotaku says that the test included several multiplayer modes including King of the Hill and Team Deathmatch. 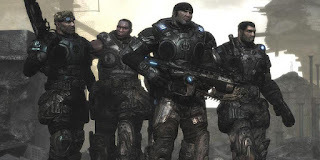 Black Tusk Studios general manager Rod Fergusson specifically said last month we wouldn't be getting Xbox One remakes of the Gears of War games. Fergusson, whose company is making a brand-new Gears of War for Xbox One, shut down rumors of a "Marcus Fenix Collection" for XB1 including the first three games in the series. "Seeing lots of buzz about a Marcus Fenix Collection, even more so recently," Fergusson said at the time. "I love the passion, but there’s no Marcus Fenix Collection. We ARE working on other exciting Gears projects." The newly revealed Gears of War remake doesn't contradict Fergusson's statement. He left enough wiggle room for himself. He denied that a bundle of Gears of Wars remakes was on the way but didn't say anything about the possibility of a single game being re-released. It's also possible Black Tusk Studios isn't involved in the project. One of Polygon's sources says that Splash Damage is remastering Gears of War. Splash Damage is the studio behind Brink, Wolfenstein: Enemy Territory and the multiplayer for Batman: Arkham Origins. Polygon notes that the company's job listings mention that they're making a "very well known and highly popular AAA title with next gen technology." Because Gears of War's remake hasn't been officially announced yet, we don't know when it's going to launch. November 7th will be the 9th anniversary of its launch on Xbox 360. However, that might be a little too close to the release date for Halo 5, Microsoft's big fall release. Maybe they'll release the GoW remake this summer to tide Xbox One gamers over until Master Chief's return? The Gears remake is also a way to hold fans' attention while they wait for the next game in the series. We haven't seen a single screenshot from the next Gears of War yet so it's safe to say it's not coming this year. We probably won't even get an official announcement of the game until Microsoft's E3 press conference in June.